Sign makers usually have pretty straightforward intentions when they put up signs. Itâ? ?s typically understood that signs inform, direct or regulate the public. So when the meaning or purpose of a sign is unclear, there can sometimes be some confusion. Sometimes that effect spirals out of control, as in the case of the Boston Bomb Scare, which incited some public hysteria. 2007 was the year of the memorable misadventure of the Boston Bomb Scare. 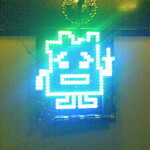 Mischief and mayhem was caused by a few simple LED sign boards depicting a simple cartoon character. A passer-by walking down the street one day in Boston, Massachusetts, noticed an incongruous-looking sign, which did not seem to have any connection to any institution or establishment that he could see. Troubled, he brought the matter to the attention of the police. Alarmed, the police brought the matter to the bomb squad. What troubled them were the signâ? ?s homemade appearance and exposed wiring and circuitry. Was the LED board an â? ?improvised explosive deviceâ?? This is what Boston officials worriedly pondered. Police, fireman, explosive specialists surrounded the â??deviceâ? ?, with helicopters swarming overhead and news crews gave the public a live up-to-the-date report. Eventually, in a daring act of bravery, they blew up the troublesome item. But what was the source of this scourge? A popular adult cartoon called Aqua Teen Hunger Force. So as to market an upcoming film based on the cartoon, a marketing firm called Interference Inc., which specialised in guerilla marketing campaigns, made and put up the signs in several cities overnight, including Boston. Although it was only in Boston, and only a couple weeks later, that the signs made the headlines. Apparently Boston officials werenâ? ?t fans of the show; otherwise a lot of shamefacedness might have been averted when the true nature of the signs came to light. The incident was largely lampooned as a â??hoaxâ? ?, although that was never the intention of the marketers. The city of Boston got their revenge by fining Cartoon network two million dollars. Oh, and they arrested the installers of the signs, because apparently itâ? ?s illegal to put up devices that may be mistaken as explosive in nature. Bear in mind that this was of course during tense times, when the War on Terror seemed a legitimate crusade. And so their paranoia, if still somewhat amusing, is at least understandable. And thatâ? ?s why you should always be careful with your signage installation. You can never be too sure how your audience will react. Queenie Bates is a writer, wannabe-know-it-all, and avid consumer of reading material – the serious and not so serious.